Fitbit devices are supposed to help keep people healthy and active. But that wasn't the case for one woman, who claimed her Fitbit caught fire while it was still on her arm. Now, the San Francisco-based company is in damage control mode. 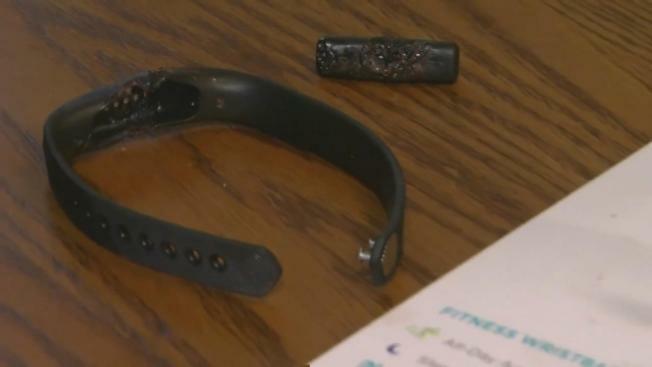 Dina Mitchell, of Milwaukee, Wisconsin, said she suffered a second-degree burn after wearing her Fitbit Flex 2 device for only two weeks. "The Fitbit itself is totally melted; the bracelet melted," she said. "And I got pieces of plastic burned into my arm." Mitchell said her doctor had to pick those pieces out of her wound. She said the fitness tracker exploded Tuesday night while she was reading a book. There was no indication anything was wrong with the device prior to the explosion, Mitchell said, and Aurora Health Care confirms Mitchell visited urgent care the next day. "This a product so many people use," Mitchell said. "My nephew, their whole class gets these from their teachers, and they wear them." The device comes with a warning. On Fitbit's website a statement cautions consumers: "The device contains electrical equipment that could cause injury if not handled properly." Mitchell said she was very careful when wearing the device, but that didn't prevent something from going wrong. "If they are exploding, or if there's some type of malfunction with them, I mean, I'm going to have a scare from this probably," Mitchell said. "Can you imagine what it would do to a child?" "We are extremely alarmed about Ms. Mitchell's complaint regarding her Flex2, and we are investigating the issue. We are not aware of any other complaints of this nature. In fact, based on our extensive internal and independent safety testing, we do not believe it is possible for this to occur under normal use. The quality of our products and the health and safety of our customers are our top priorities. Fitbit products are designed and produced in accordance with strict standards to ensure the safety of our users." Since news of the fire got out Monday, Fitbit stock has fallen by about 1 percent in after-hours trading.